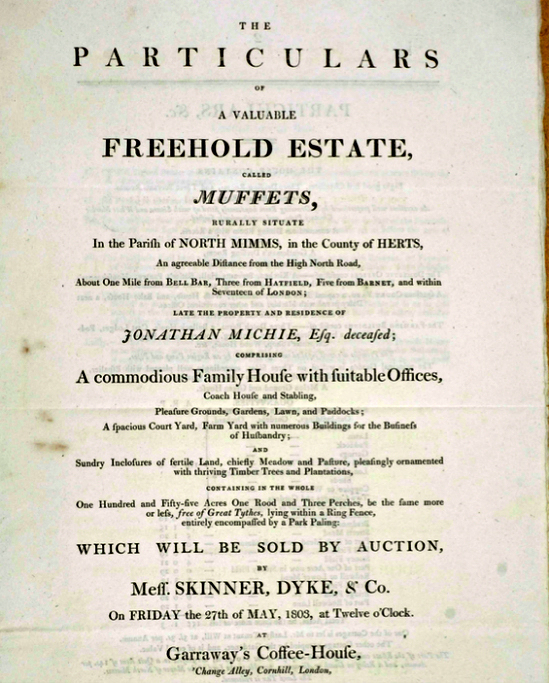 The brochure for the sale in 1803 of Muffets was loaned to this site by local historian Peter Miller so that it can be uploaded for others to view. The auction involved the sale of 150 acres, one rood and three perches of land. For the definition of these terms please see the text below from Wikipedia. The lot is described as "A commodious family house", and includes stables, pleasure gardens, "buildings for the benefit of husbandry", timber trees and plantations.You can download and enlarge the pdf of the brochure below.